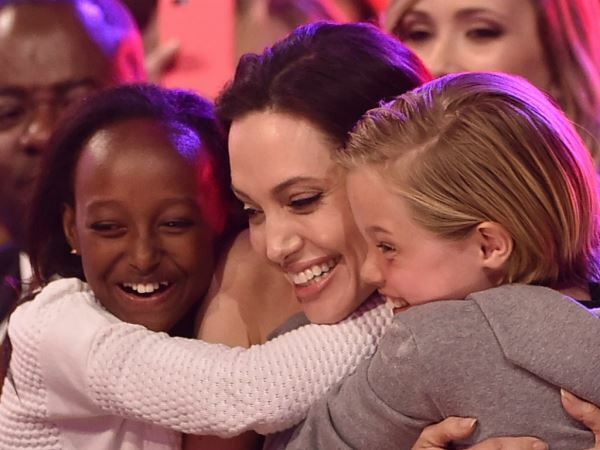 Angelina Jolie celebrated her Kids’ Choice Award with Zahara and Shiloh last night. The Nickelodeon event took place at The Forum in Los Angeles and the Hollywood star took home the prize for best villain thanks to her role in Disney’s Maleficent. Despite recently announcing she’d had her ovaries removed, the star looked healthy and happy as she hugged two of her six children with Brad Pitt when her win was announced. Angelina (39) is a carrier of the faulty BRCA1 gene mutation and in 2013 underwent a double mastectomy after finding out she had an 87 per cent risk of developing breast cancer and a 50 per cent risk of getting ovarian cancer. She underwent the second operation after blood tests had shown a number of inflammatory markers, which could be a sign of early cancer. The actress presented a touching speech when she hit the stage to pick up her prize. “When I was a kid I was told - like Maleficent - that I was different,” she told the audience. “But then I realised something: different is good. So maybe you don't fit in. Be yourself. Angelina beat competition from Cameron Diaz in Annie, Donald Sutherland in The Hunger Games, Jamie Foxx in The Amazing Spider-Man 2, Lee Pace in Guardians of the Galaxy and Meryl Streep in Into the Woods. Other big winners last night included Ross Lynch, who won best TV actor, and Laura Marano, who picked up the female equivalent. Ben Stiller won favourite movie actor, while Emma Stone was honoured with favourite film actress.